Enjoy a day fishing on the Chesapeake Bay. We offer 3, 6 and 8-hour fishing trips with all licenses, bait and tackle provided. Each trip will include a USCG licensed captain and an experienced mate to guarantee you will have an enjoyable and safe trip. The captain and crew are experienced with the fishing techniques necessary for a successful day. 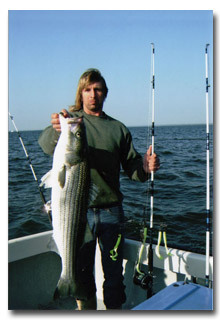 April-May	Trophy rockfish season: This is the time of year to catch that fish of a lifetime! Rockfish of up to 50 lbs. are caught this time of year. Here is your chance at a wall hanger. Mid-May to Mid-June: This time of year we are trolling for rockfish. Some trophy fish are still to be caught this time of year and the limit increases to two rock per person. June, July, August: The fishing is as hot as the weather. We will be trolling, chumming, jigging, live-lining and bottom fishing this time of year. We catch rockfish, bluefish, perch, Spanish mackerel, catfish, croaker and spot this time of year. September-October: Fishing is very productive this time of year. As the weather cools it is not uncommon to see acres of “breaking fish.” Rockfish, bluefish, perch and catfish are biting best this time of year.